We are offering Sunscreen Gel to our customers. We are offering Sun Protective Cream SPF 30. Non-irritant suitable to all skin type. Frequently used In Organic UV filters, used In sunscreen products. It absorbs UVB shot UVA rays. It preserves the integrity of cosmetic ingredients prevents deterioration under the sun. They support physiology of skin. They build up the some structure as skin. 5) 1-3-BUTYLENE GLYCOL: SOLVENT VISCOSITY DECREASING AGENT. 7) PROPELENE GLYCOL: solvent viscosity decreasing agent. 8) GLYCERIN: humectants, prevents premature loss of moisture from cosmetics. 9) Acryl ate co-polymer: Film former, Absorbent, Adhesive, Suspending agent. 10) Tri-ethanolamine: Use to control PH. 11) DMDM Hydantoine: preservative presents microbial growth. 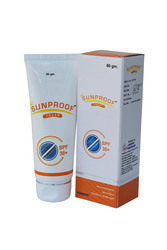 We produce Sun Protective Gel SPF 50 in SPF 50+ (75GM). Non-irritant & suitable to all skin type. It absorbs UVB & shot UVA rays. It preserves the integrity of cosmetic ingredients & prevents deterioration under the sun. 5) 1-3-BUTYLENE GLYCOL: SOLVENT & VISCOSITY DECREASING AGENT. 7) PROPELENE GLYCOL: solvent & viscosity decreasing agent. 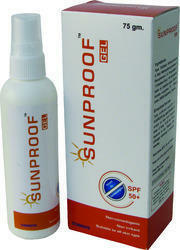 We produce Sunproof Gel in SPF 50+ (75GM).